Oops - we don't appear to have a video for the DocuMate 262. I bought the DocuMate 262 about six months ago based on its specification and good reviews. I have several applications, some involving archiving thousands of double-sided sometimes colour printed A4 papers. The duplex facility was therefore most important. I like to scan at 300dpi so I can reproduce stored images at high quality. I must say the its performance in terms of speed, quality and reliability has been very impressive. It’s a compact yet sturdy, well-built device, sits well on my desk and rarely misfeeds. I’m delighted with it and would hate to be without it. My office is now virtually paperless with my document images held on a small inexpensive external drive and the original paper recycled – bliss! The DocuMate 262 is a great piece of equipment – just what I needed. It is quick, small enough to fit on anybody’s desk and provides good quality scans. The duplex function is brilliant. I would definitely give that scanner a 5 out of 5 rating. The Xerox Documate 262 that we bought from you has proved to be the ideal solution for scanning batches of documents into our electronic filing system. The paper handling is excellent and the vertical paper path reduces paper jams to a negligible quantity. Very, very pleased with the Scanner. It had been recommended to me by a Mortgage Packager who got very excited about how quick it was and how it had revolutionised his back office operation. At the size of a bubble jet printer we initially thought it was a lot of money for such a small package, but any doubts were dispelled once we saw it in action. 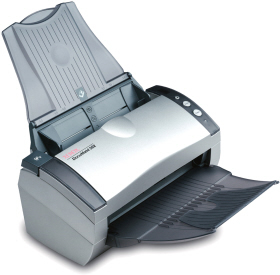 It is fast, efficient and produces excellent quality scanned documents – far better than our previous scanner. Even though we are impressed with the scanning speed it keeps advising us (through a little pop up bubble message) that it can scan even faster if we use a USB high speed port – but to date we haven’t found the need to. There's a lot to like about the Visioneer Xerox DocuMate 262 document management scanner - the faster, better, easier-to-use workgroup scanner solution. 30% faster than the leading brand workgroup scanner in duplex mode, the DocuMate 262 is the price and performance leader in its category. It also includes a powerful suite of applications that improve image quality, OCR accuracy, and document management. And its revolutionary One Touch scanning and small compact size make it easy to use on any desktop or in any department. The DocuMate 262 quickly handles many different tasks at hand - right at the desktop. It has a 50-page automatic document feeder that scans up to 66 images per minute using dual CCDs - doubling your speed and productivity for two-sided documents. The DocuMate 262's powerful software, robust functionality, and hardware specifications deliver the speed and quality you would expect from a more expensive scanner. A searchable PDF feature lets you send, copy, paste, re-use, and highlight text while maintaining the integrity of the original document image. And document size is not an issue for the DocuMate 262. It scans everything from business cards and photos up to legal-size documents, with superior image quality. The DocuMate 262's One Touch technology scans from the desktop to nine different customizable applications or devices, and documents can be converted to text-searchable PDF in one easy step. Now you can instantly search documents for keywords or phrases. The DocuMate 262's one-step installation is a snap with the plug and play Hi-Speed USB 2.0 port. And its small footprint, just 6" x 13", makes it ideal for the desktop. The DocuMate 262's One Touch technology lets you send documents to nine preselected or user-defined destinations, eliminating up to 12 steps in the scanning process. Think improved speed, performance, and most importantly, productivity. The DocuMate 262's PaperPort Pro Office software lets users convert existing electronic files to PDF for storage or transfer. Supported file types include Microsoft Office, Corel, and AutoDesk documents, as well as the popular TIF, MAX, JPG, and BMP formats. DocuMate 262's One Touch feature lets you send documents to preselected destinations, including searchable PDF. Quickly turn PDF files and stacks of papers into easily editable word processing and spreadsheet documents. ISIS drivers certified by Pixel Translations ensure that the DocuMate 262 functions properly with the more than 250 commercially available ISIS-compatible imaging and document management applications.